I rarely contribute to this site, I have other people do it due to time constraints. However, I am so vexed today I must get this off my chest. 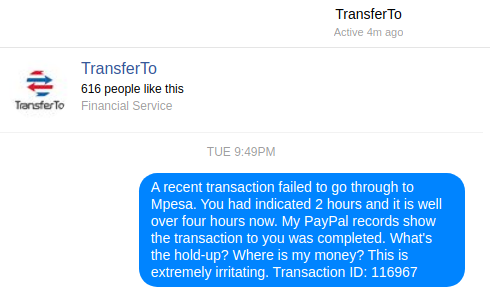 I am almost foaming at the mouth because of the antics of Safaricom, PayPal and another company known as TransferTo. In case, you aren't already aware, Safaricom, PayPal, and TransferTo entered into a partnership a few weeks ago to provide a PayPal to Mpesa money transfer service. In essence, you can now withdraw funds from PayPal and load your Mpesa account via TransferTo. This, as expected, was received positively by the millions of Kenyans who work online. So, I quickly set up an account on the TransferTo website and did my first transaction for $136.73 on 17th April. It went smoothly. TransferTo's onscreen message advised that I was to receive the funds within three hours and, I did! I was elated! In fact, as soon as you click "Submit" on the TransferTo site, Safaricom also sends you a message letting you know how long to wait for your money and the amount to expect. A few days later on 27the April, 1st May and again on 4th May, I did three more transactions, all without a glitch. And then, on May 8th, the unthinkable happened. Having gotten accustomed (somewhat) to the process, I withdrew $181.09 and got the usual onscreen message from TransferTo and a text message from Safaricom, both advising me that I would receive the money within two hours. Safaricom's message read, "Your withdrawal of USD 181.09 from your PayPal is being processed. You should receive 17, 616 in your M-PESA in 2 hours." For those familiar with TransferTo, you are also aware that their onscreen message usually provides a specific ETA. In my case, it said, "within two hours". I withdrew the funds around 5:20 pm on 8th May 2018 and was, therefore, expecting the funds to hit my M-pesa latest 7:30pm that evening. At around 8pm, I retrieved my phone from the charger and was surprised to find my M-Pesa uncredited. Curious, I fired up my computer and logged into PayPal to check if the transaction had failed (or something). The transaction record didn't show anything amiss. See the screen capture below. The transaction cleared smoothly from PayPal to TransferTo. 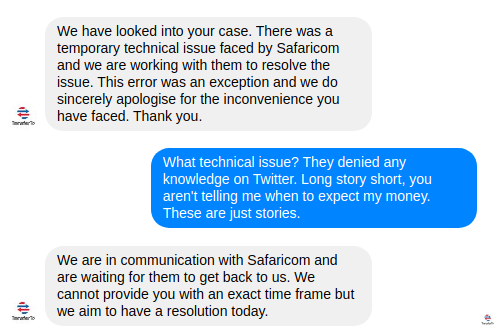 Having established there was nothing wrong with PayPal's end, I took to Twitter and asked @Safaricom_care. I have embedded the tweets below. Two hours. That was at 5:20pm this evening. It is now 8:50pm. What does that mean? Why would you send me a message stating, "WITHIN TWO HOURS" if that isn't the case? How long should I be patient? You can't just leave it open-ended like that! Patience is finite! PayPal and TransferTo totally failed to respond despite several additional tweets and emails until 9th May at around 4am. 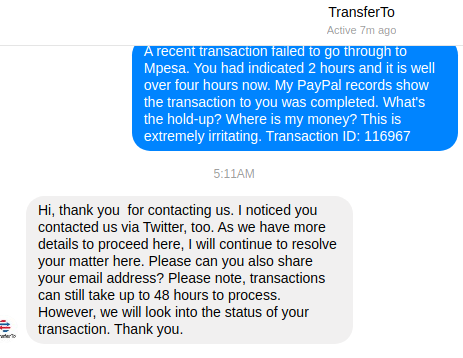 I woke up and found a response to my Tweet and FB from TransferTo. Hi, thank you for contacting us. 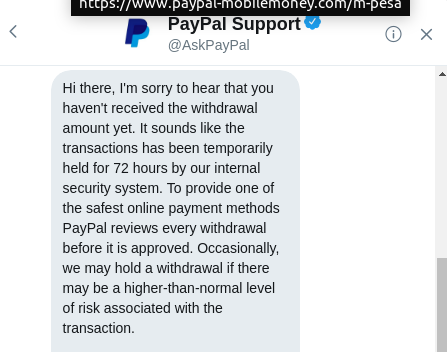 Please can you send a DM with your transaction ID so we can look into the matter. Thank you. 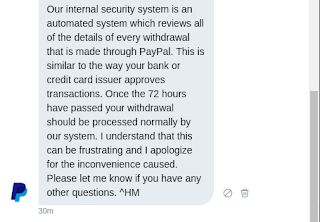 PayPal also requested further information via DM. So, I did exactly that. I provided PayPal with more information and waited for further communication from TransferTo. The answers I received left me in total shock. See below. First, TransferTo came back and blamed Safaricom. So, what is the true position? 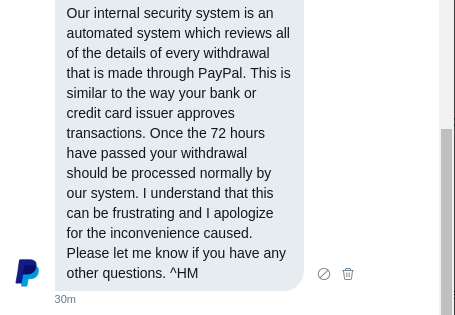 Is Safaricom the problem or did PayPal's internal security system place a hold on my money? I'm I unreasonable to expect a unified position given that these three firms are partners in this PayPal to Mpesa thing! 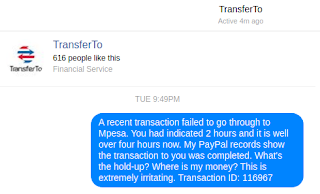 To make matter worse, a few minutes later on 9th May 2018 at 10:30 am, Safaricom sent me a text message advising me that the transaction could not be completed and advised me to contact paypal-mobilemoney.com (TransferTo)...further confusion. My money was effectively in no man's land! 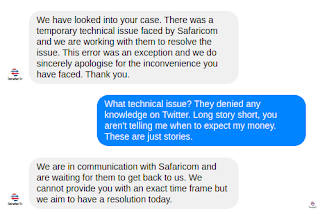 Safaricom is clueless - They will give you canned responses and avoid giving you any straight answers. When you push them, they run for the hills and refer you back to PayPal. Support from all three is Flaccid - Flaccid means weak, ineffective. When you use this service and have a problem, you should expect nothing more than weak and ineffective support. Deceptive and unprofessional communication - don't believe the onscreen message from TransferTo giving you a timeline (in my case 2 hours). From my experience, that message simply isn't true. They will refer to you to their fine print which says three days when you complain. Stick to Equity Bank. I have used them in the past without incident. They take three days but the fee is only 1.5% compared to Safaricom's 3%. There are also individuals and small companies such as ExchangePesa by Martin Karugu that offer an instant service and have proven reliable. Have you encountered something similar? Please share in the comments section. Update: The money was eventually refunded and I withdrew it instantly via ExchangePesa.